It's hard to explain the Yule log video phenomenon without sounding like one is talking about some ritual on Mars. Because at one level, all explanations notwithstanding, it's inexplicable. Each year there are televised videos of log fires burning and nothing else happening. A video of a fireplace with a log burning. You can hear the crackling of the fire. You can see the flames leaping about the fireplace, the shadows dancing on the hearth. And that's all you see, because absolutely nothing else happens. It's a phenomenon that's been in place since 1966 but only recently exploded on the interwebs. The custom of burning the Yule Log actually dates to before medieval times and was originally a Nordic tradition. According to whychristmas.com, "The Yule Log was originally an entire tree that was carefully chosen and brought into the house with great ceremony. The largest end of the log would be placed into the fire hearth while the rest of the tree stuck out into the room! The log would be lit from the remains of the previous year's log which had been carefully stored away and slowly fed into the fire through the Twelve Days of Christmas." Come 2015, though, and the Yule Log is no longer in your living room, it's on the internet - in the form of digital videos of a fire burning, for as long as you have the patience to watch. Even if you'd never registered the phenomena before, in the past week or so, it's been almost impossible to escape the sight of Hollywood actor Nick Offerman in a new take on the yule log - one in which a human being sits in front of the same log fire, a shot of whiskey at his side, and stares silently into the camera. In the hands of a lesser actor, it wouldn't work. In the hands of a lesser director - this silent 45 minute tribute to the Yule Log video was directed by Werner Herzog - it wouldn't work. But miraculously, this particular video just works, and how. Odes are already being written to the acting chops that allow Offerman to look unspeakingly into a camera for 45 minutes and get the better of it. Analyses have already been written of the performance. Minute-by-minute's traded - even by those who realise they may be overthinking the stuff. It started out being a video of a fire burning. Over the year, the Yule log video is more meme than trope, and you can now watch five straight hours of a burning Darth Vader yule log, which is, predictably, not as enticing as the original fire thing. The Nick Offerman Yule Log video quickly became such an epic that 45 min of it just weren't enough. As of December 23, therefore, there's now a 'Ten Hours of Nick Offerman's 'Yule Log' video - which is the original video, but on loop. You can now fall asleep to this lovely man. In 1966, the Yule Log became a national televised program in the United States, broadcast on Christmas Eve or Christmas morning. It started when Fred Thrower, president of New York City's local television station WPIX, suggested that the station announce the cancellation of all its programming that evening and present a "WPIX Christmas card to our viewers." In a November 1966 memo, he proposed that the Christmas card would consist of a closeup of a fireplace, with Christmas stockings and flaming Yule logs "which would be repeated (via a looping process) over and over continuously". The New York Times subsequently called it "the television industry's first experiment in nonprogramming." It was a joke. But it became something so much more. It was also an unmitigated success. The only drawback was the length of the original 16mm footage - 17 seconds long, with flames noticeably skipping every time it would loop. In 1970, WPIX decided to reshoot the video. This time it was a 35mm six second loop. 1. The inaugural Yule Log program cost WPIX $28,773.95 in ad revenue (adjusted for inflation in 2013). The first showing in 1966 replaced the roller derby program. 2. An antique rug was ruined during the 'shoot'. This was thanks to a stray spark when producers removed the grate to improve the view of the fire. The rug was valued at $4,000 in 1966. Adjusted for inflation, it becomes the same $28,773.95, the station lost in ad revenue. The Yule Log video (nonprogramming) aired for 23 years straight, from 1966 till 1989, on New York City's television station WPIX. Then in 2001, the program was revived and spread to other affiliate channels of WPIX. The program ran between two to four hours and consisted of a yule log burning in a fireplace on loop. You'd think it was a real fire and in fact, people have often claimed they turn it on just to get some warmth. It is accompanied with some background Christmas music to set the tone. 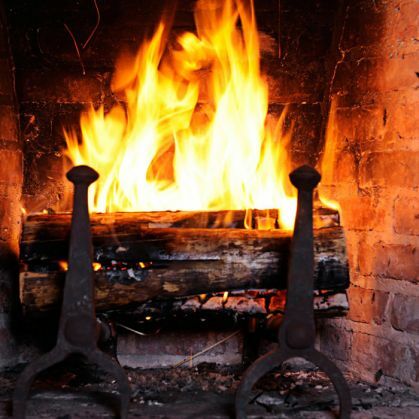 In March 2000, Joseph Malzone, an ardent fan of The Yule Log, created a "Bring Back The Log" website. It's now named TheYuleLog.com. In December of 2013, Netflix got into The Yule Log game with its own Fireplace for Your Home video. That version simply has the crackling and popping sound. The other, Crackling Yule Log Fireplace, is backed by Christmas songs. They even have a behind the scenes video. Social media, what do you think? Clearly, if watching a log burning for hours doesn't make you warm, then it will at least give you a good laugh. At least going by these comments for the Netflix 'special' on social networking website Reddit. "I wish they'd add cats. This would be better with cats," says Redittor Veruka_Salt. "I'm having a really hard time deciding whether or not to turn off Harry Potter for this," Redditor Traceyt715 exclaims! Amazing!" Redditor ChiliNachoBoozehead says. Yes, it is a must watch with subtitles, I can testify to that. Redittor WhileFalseRepeat's one paragraph review, "I found the actors were rather wooden and the dialogue lacking. The cinematography was sometimes beautiful, but the director obviously has some serious OCD issues and the whole thing was rather predictable. I knew how it would end within the first minute." Redittor Lyndercat decided to play it at a party, "I played episode 2 at my Christmas party last night. As soon as the first "popping" subtitle came up at around 6 minutes, I knew the party was getting too rowdy and it was time to send everyone home." Of course, before you hand your life over to the Yule Log, know that it's an addiction - from a generic video of a fire burning, crackling sound and all, to the more 'evolved' versions that have bacon frying, cats stalking around a fire, or a couple fighting. And you can watch them all in one glorious, continuous loop, or put it on video in the background and continue with your life and work - just feeling a little warmer than before you gave up your TV-time. Thankfully to make up for that, you'll have a far more pleasant sound - the roar of a crackling fire or a log burning in the magical world of the internet.